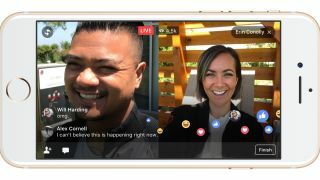 Facebook continues to pump up its Live streaming service with new features, and today it's unveiled two more designed to make broadcasting alongside friends easier, be you audience or host. Instead of having your comments lost in a sea of randos shouting over each other, Live Chat With Friends lets you invite folks to a private conversation thread so you can gab about the same live video in peace. The second feature is called 'Live With,' which lets you notify a friend the next time you go online with your own Facebook Live broadcast. During a stream, you can invite a guest from among your viewers to join in via a picture-in-picture or side-by-side video feed, depending on your device's camera orientation. Not only does this make a conversation between individuals easier on Facebook Live, but we can see "calling in" viewers being a useful addition for hosting seminars, special guest appearances, or events that are prime for audience participation. Right now, the feature appears to be limited to two participants at a time. Facebook is currently testing out Live Chat With Friends and Live With for mobile devices "in several countries," and is expected to roll out both features later this summer.